The only thing better than a gaming laptop is a gaming laptop that your boss pays for. That’s the scenario MSI is proposing with its GS65, announced Tuesday. An update from the excellent GS63VR, MSI said the GS65 is designed to be a little more sedate-looking, the better to blend into your business meeting. Although it still has MSI’s dragon on it, the word “gaming” has been removed, for instance. The keyboard sacrifices translucent key skirts for enclosed ones, to make the per-key lighting less obvious. Inside, though, MSI says it’s all gaming. The biggest change is in the CPU, which will draw from Intel’s 8th-gen 6-core Core i7 chips, also announced Tuesday. In addition, you’ll find GeForce GTX 1060 discrete graphics, along with an option for a GeForce GTX 1070 Max-Q. While the GS63 came with a 1080p 60Hz screen and an option for a 4K panel, the GS65 features a 1080p 144Hz panel. The panel isn’t quite approved for G-sync, but MSI tells us it can support Nvidia’s variable refresh-rate technology. The screen on the GS65 also folds to 180 degrees and features a truly miniature webcam on the top bezel, an improvement over being located beneath the display. MSI prioritizes battery life this time around, too. The GS65 sports an 82-watt-hour battery, which is a big step up from the GS63VR’s 62-watt-hour power plant. Even with the larger battery and faster CPU, MSI says the GS65 should weigh about 4.1 pounds, noticeably less than the GS63’s 4.9 pounds. Much of that, MSI says, comes from the screen, which is trimmer than the previous model’s. 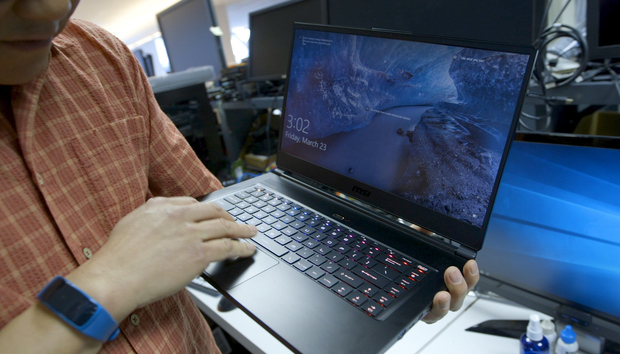 The company said the GS65 with a 1080p 144Hz panel, 6-core Core i7, 16GB of RAM, and 256GB SSD should hit the streets for about $1,800 later in April. For $200 more, you can upgrade the GPU to the GeForce GTX 1070 Max-Q.